I'm not a likable guy. Boris Yellnikoff has a rather dim view of humanity. He views all human endeavour as worthless, all affection as meaningless, and everyone he meets is either a cretin, a moron or a zombie. He's no prize himself. Despite being, in his own words, a profound and sensitive soul with an enormous grasp of the human condition, Boris is a hypochondriac who has to sing 'Happy Birthday' twice when he washes his hands to keep the germs away, and mistakes mosquito bites for melanoma and indigestion for thyroid cancer. After a late-night epiphany in which he realises that he is dying, not now, but eventually, Boris unsuccessfully attempts suicide. After he gets out of the hospital he divorces his wife, gives up his position as a professor teaching string theory at Columbia, and spends his days ranting at anyone who'll listen. His friends, the children he teaches chess to part-time, even the audience watching are harangued about their existence as Boris expounds his philosophy about life, the universe and everything. Enter: Melody, (Evan Rachel Wood) an impressionable girl from Mississippi. With her mix of naivety and broad Southern accent, she's like something out of a William Faulkner novel. Melody ran away from home because of her ability for fooling around with the boy who caught the biggest catfish in town, and winds up on Boris' doorstep asking for food. Boris begrudgingly lets her into his apartment for one night, but quickly realises that she is not going to be all that easy to get rid of, and he may not even want to get rid of her. Originally intended as a vehicle for Zero Mostel, and which was shelved following his death in 1977, Whatever Works is probably Woody Allen's funniest film in the better part of a decade. 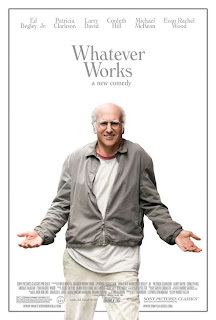 With Larry David as a near-perfect Allen substitute, the film delights in his acerbic diatribes about the stupidity of humanity. In his view, people who call their mothers 'Mom' should be executed, and children should spend two weeks every summer in a concentration camp to really get a sense of what the human race are like. It's a gleefully misanthropic view of the world that makes perfect use of Larry David's particular brand of passive-aggressive hectoring. Larry David is terrific at delivering the film's long, breathless monologues, and his back and forths with Evan Rachel Wood are frequently hilarious. There's a real chemistry to their culture-clash conversations, whether he is dismissing her views on religion or she says that he was nominated for a Nobel Prize for Best Picture, and this chemistry makes their relationship make much more sense on screen than it should, since on paper it sounds quite mean. If David wasn't wryly amused by this creature that has wandered into his life, and if Wood wasn't so sweetly naive, then the film could have been a rather bitter piece in which an old man insulted a young girl for 90 minutes. Beyond its first half, Whatever Works introduces several secondary characters that take the focus away from the central relationship, to the film's detriment. Patricia Clarkson and Ed Begley, Jr. show up as Melody's God-fearing parents, and whilst they are both incredibly funny when they are with David and Wood, and even on their own, (Begley, Jr. gets the funniest scene in the film when he talk to a gay man in a bar) the move away from the tight, focused first 45 minutes does slow things down markedly. It also doesn't help that the last half sees the more emotional side of the story comes in to play and reveals the limitations of the leads. As good as he is at capturing the caustic wit of Allen's script, Larry David is just too blunt to give Boris any of the vulnerability that Allen's best characters have. His neuroses seem affected and the wary, sarcastic Larry David of Curb Your Enthusiasm never disappears, so when he has to express any genuine sentiment it rings false. Not that there aren't moments of real poignancy, such as a beautiful speech Boris gives about the miraculous, random nature of the universe bringing him and Melody together, just that David rarely hits the dramatic notes that the film needs him to. Similarly, the second half sees Melody going off on her own without Boris, and the character winds up feeling lost without her sparring partner. The film needs that chalk-and-cheese dynamic to work, and on her own Melody is pure cheese. Whatever Works could be accused of being elitist - its central premise seems to suggest that all that's needed to fix the gaping divisions in America is for the hicks to move to New York, take up photography and get involved in an hilariously benign ménage à trois - but there's a genuinely uplifting message at its heart. Boris' acceptance of the meaningless of existence gives rise to his theory of 'Whatever Works': whatever makes you happy, do it, because it ultimately doesn't matter. It's a philosophy that pulls the film through its contrived final act, and allows it to end on a note of grace that delivers sentiment without sentimentality. It's the sort of ending that even Boris Yellnikoff couldn't completely hate.